On the line with me from London, it’s a warm welcome to David Perel, who has a pretty unique story. Now, David, you do GT3 motor-racing for the official Ferrari World Championship Team, Kessel Racing, but you weren’t always a race driver. Can you tell me about your pivot from being a successful tech entrepreneur in Cape Town to race driver? Hi Gareth, thanks for having me on. For my whole life, I’ve been passionate about motorsports. When I was 3-years-old I saw a photo of my father in a racing car: he had a very brief attempt at becoming a racing driver but it turned out it wasn’t really his thing, and these photos set me off. Around the age of 15 I got my first [racing] kart. It was a really old kart. I think it cost my family about R5 000, and I got started in that – racing at Killarney in Cape Town. It started to go really well. When I was 23, I finished 6th in the world in the karting world championships, but I ran out of money because when I was 18 I had to start funding my own racing, and by the time I was 23 I had completely run out of money, pretty much everything I had. So, I decided to stop and I’d already started a business with my brother – we were building websites and we were also starting to build some web technologies. I turned my focus to the tech side of things and stopped going to racetracks, stopped reading racing news, and yes, I basically worked 20-hour days until I was 29, and then decided that I would give it another shot. In fact, your tech business, which is called Obox, has been hugely successful. Are you still involved with it these days? It must be quite nice to have your brother involved with it as well? Yes, so my brother and I are only one year apart, we’ve seen each other almost every day of our lives until I moved to England. He mostly runs the business now. To be honest with you, I am only really involved about an hour a day, when he chats to me about what’s going on. When I decided to do the racing thing again I didn’t expect it to go as well as it has. I thought I was going to do one or two races. I thought I’d experience one or two cool things and then go back to my normal life. 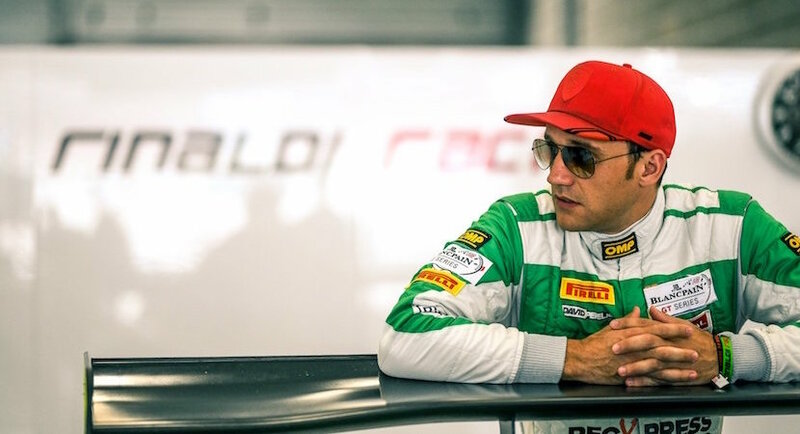 But as I started to win more races, more opportunities have come my way, and I figured that at my age that I’m still young enough to be full factory driver, I’m still young enough to earn enough a living from motorsports – I might as well give it a try. Can you tell us about your team, Kessel Racing. They’re a pretty big deal. Why is it such a huge thing to be racing for them? So, I race now for two teams. Kessel is one of them; the other is Rinaldi. Both of them are Ferrari-based teams. Kessel, in particular, is a big deal because they were actually responsible for developing one of the Ferrari GT3 cars that we use to race, the 458 GT3 was developed by Kessel Racing. So, they created it, they had the idea to take the 458 road car, convert it to racing and put it on the racetrack, which is not a small thing. Ferrari is one of the top 10 brands in the world and they trusted this company, which is not a small company by any means, to develop this racing car. I had the honour of racing with them last year and winning with them. They only have three factory drivers in Kessel itself, which is professional drivers, and I was one of three. I effectively came off the street. It was through cold-calling and hustling, basically, that got me that drive. It’s a pretty special feeling – surreal actually. It must have been something that you always dreamt of. Yes, I suppose lots of kids dream of owning a Ferrari or driving a Ferrari. I had a picture of a Ferrari F430 Spider on my wall, which was silver, in my late teens, which I really desired. I never in my life honestly ever thought that I would actually race with Ferrari on a consistent basis. I think this year I’m one of the busiest Ferrari GT drivers in the world. I definitely drive more than most Ferrari racing drivers at the moment (obviously excluding the Formula 1 guys) and I can’t believe it. I truly cannot believe it when those words come out of my own mouth. During your time, when you were still in Cape Town, heading up your business Obox there, you were training to get into racing. Can you tell us the process involved? You literally, had to work like 20-hour days and train for extremely long hours to get to where you are? Yes, so I took a six-year break from racing but during that whole time, I always intended in coming back. So, I was saving money. I had a specific savings accounts for my return to racing, but at the same time, I was staying sharp. My brother and I – we’re not fitness freaks by any means – but we do enjoy being fit. So, I was always going to the gym with motorsports in mind. I would never bulk up. I would always try and stay as light as I could. So, I really enjoy running – I ran 5–10km a day, which was pretty standard. But that’s not such a big deal for anybody to do. The other thing that I did was using a simulator – I used my PlayStation a lot, and I still do, but during the time that I wasn’t racing I was spending maybe three to four hours a week on it, using steering wheel pedals that I bought. I used games like Gran Turismo, Formula 1, and all those games to stay sharp. I would race online against the best Gran Turismo players to make sure that I was still as good as them. Then I figured, well, if I’m as good as these guys, online – who get infinite practice – then maybe I can be good enough in the real thing if I do, one day, come back. I’ve read through the list of races that you’ve won. It’s pretty incredible and a very long list. Can you tell us about some of your memorable race wins so far? Yes, I’ve been very lucky. Last year I had really good teammates because of the kind of racing I do, which is endurance racing. With endurance racing, you effectively share the car. So, let’s say it’s a 6-hour race – I would do two hours and then during the pitstop, I would get out of the car and the next driver would get in, and he would do two hours and so on. I’ve been very lucky to have drivers which have been reliable. They don’t crash. At the end of the day, when they’re in the car you have no control. You’re just sitting on the sidelines being super nervous. But I’ve won the biggest GT race in the world, I’ve won it twice, it’s called the Spa 24 Hours. I won it last year as an amateur ranked driver and then I won it this year as a pro-ranked driver in the Pro-Am Class. This year I had no expectations, and in the first 12 hours we were actually in second place, a lap behind, but then we realised that our strategy for the long-term was actually much better. I got back in the car and really started to push like crazy. I managed to catch the leaders, un-lap ourselves and then catch them again, and pass them for the lead. It was so surreal that I didn’t actually believe what was happening. When we crossed the line… To win Spa… to finish Spa is an achievement on its own. There are 60 cars that start and maybe 25 that finish, and now I’ve stood on the podium twice and not only that but at the top. It’s something difficult to understand. That’s incredible. What does your day-to-day life involve now, in terms of a training perspective – it must be very intense? Actually, once it becomes your job, the intensity falls away a bit. You can’t be intense every day of your life, otherwise, you’re not going to be a functional human being I suppose. I do three hours of simulator each day, and about an hour to an hour-and-a-half of physical exercise, but that’s when I’m at home. Most of the time, I’m on the road. I’m testing somewhere or I’m coaching what we call gentlemen drivers. These are guys who own their own race cars and want to learn how to become racing drivers and learn about racing. I’ve just come off a three-week trip, where we’ve been at racetracks almost every day of the week. When that’s your schedule, in order to exercise is really difficult. I’ve got a week off, where I’m back in London and I’m going to be getting back into a healthier routine. Are you based and live in London now? Yes, I reluctantly moved here from Cape Town last year. I used to travel back and forth but the 20-hour trips were starting to wear me thin. And as more opportunities came along I realised that I had to be based in Europe. So, I’m Cape Town boy through and through. I really miss home but you’ve got to do what you’ve got to do. Would you still come back to Cape Town one day? Yes, absolutely. I don’t how long this dream will continue. I’ve always said that as long as I’m racing I’ll keep making sacrifices but when this all stops, I’ll be on the first flight back to live in Cape Town. To give our readers and listeners some insight into what it’s like to race these motor vehicles, can you tell us how fast do you go, and what kind of impact does it have on your body when you’re racing these cars? The cars we race look like the standard road cars that you see on the road, but they’re heavily modified. The truth is, they almost have no relation to the road cars. They have 550hp. They can almost do 300 km/h. We top out at about 290 km/h. They can go faster but I’m not sure why the governing body limits us … Nevertheless, 290 km/h is the limit, and we do 0 km/h to 100 km/h in about 2.5 seconds. But none of that is impressive compared to the braking. We can brake from 290 km/h to about 80 km/h in 110m, and I’m telling you if you have any moisture on your face from sweat, when you hit the brakes it literally goes onto your visor. The forces are pretty cool but the most intense part of driving these cars is actually the heat inside the car. They can get up to about 60 degrees. I’ll be racing in Japan in 2-3 weeks’ time and I’m not looking forward to the sauna that I’m going to be inside for 10 hours. Actually, we train the most to cope with the heat because you’re just sitting there and your heart rate is at 160. It must be a huge mental challenge as well, to keep yourself focused for really long periods of time? Yes, we drive for up to two hours at a time and that’s why I use the simulator at home. I often drive for long periods of time on the simulator to improve my concentration. I’ll be honest though, with the new culture of using your phone all the time and notifications don’t help the human mind when it comes to becoming better at concentrating. But it’s just part of the game these days, I suppose. The simulator helps and when you’re competing and something happens, the adrenaline then kicks you into a different gear and you get into the zone. David, just as the last question, you’re obviously, a hugely focused and self-motivated person. So, what is your next goal and your ultimate goal with your racing career? There’s two of them. The one is to race at Le Mans and win, as a South African. I won’t necessarily be the first but I was watching Le Mans when I decided that I wanted to give this another shot. So, Le Mans is still on my mind. The second one, which is a bigger goal, is to drive for the actual Ferrari factory team. Now that I’m driving with Kessler and Rinaldi, I’m not official yet but I’m very much mixing it with the official guys. To be an official Ferrari driver, with the red cap, would be the ultimate goal. David Perel, it’s been a fascinating discussion. Thank you so, much for telling us about your career and what’s going on with your latest racing endeavours. Thank you so, much and I just hope that I continue to make South Africans proud on the racetrack.